I recently had the pleasure to listen to Ilya Grigorik give a talk at Velocity in NYC on Breaking the 1000ms Mobile Barrier. During the talk, Ilya used PageSpeed Insights to demonstrate that several high profile websites had overlooked some very simple and common optimizations and resulted in poor PageSpeed scores. For the unfamiliar, Pagespeed Insights is a web based tool created by Google that analyzes the content of a web page, then generates suggestions to make that page faster. It can’t be that hard, right? Well…there is only one way to find out! I picked Apache over Nginx simply because I’m more familiar with setting it up and configuring it. I choose the Bootstrap example because I felt it is composed of the many elements you’ll find on a modern website. These elements include several exteral CSS and JS dependencies (3 CSS & 3 JS), a top oriented navigation bar, and a decent amount of content. Plus, Bootstrap is widely used across the web, so why not look at how we can make it faster? Easy enough, so let’s get started! Let’s begin by generating a PageSpeed score from the off the shelf Bootstrap example. This will act as a baseline for the rest of the test. So it seems Bootstrap scores much better in desktop then mobile, along with a DOMContentLoaded of 833ms. Not to shabby to start off with, so let’s see how we can improve. UPDATE: Below is a mod_pagespeed configuration that will get you a perfect PageSpeed score for this Bootstrap example (without any manual work)! A big thanks to all the folks at Google for providing feedback to this article (read the original discussions here and here)! For the first optimization, we’re simply going to enable the Apache PageSpeed module and let it do all the hard work for us! Well think again, because enabling PageSpeed with its default set of filters only gives a boost of 3 points for both mobile and desktop. Not much score improvement, but mod_pagespeed did automatically concatenate all our CSS and apply cache control to both CSS and JS, so that’s kind of nice. It looks like we’re gonna have to get under the hood and get our hands dirty with some good old manual optimizations. So let’s start with some low hanging fruit. Bootstrap fortunately ships with minified copies of most of it’s CSS, with the exception of theme.css. So we’ll be using the trusty old yuicompressor to get the job done! This change is very straightforward, but doesn’t yield many points. So let’s continue onto the next one. Welcome to The Fold. No not the band, but that imaginary line in a website that divides the top 600 pixels of content a user first sees from the rest of the content they will eventually scroll to. In the world of The Fold, anything “below the fold” is considered a second-class citizen. And according to Google, things below the fold need to be eliminated from blocking our need for speed. 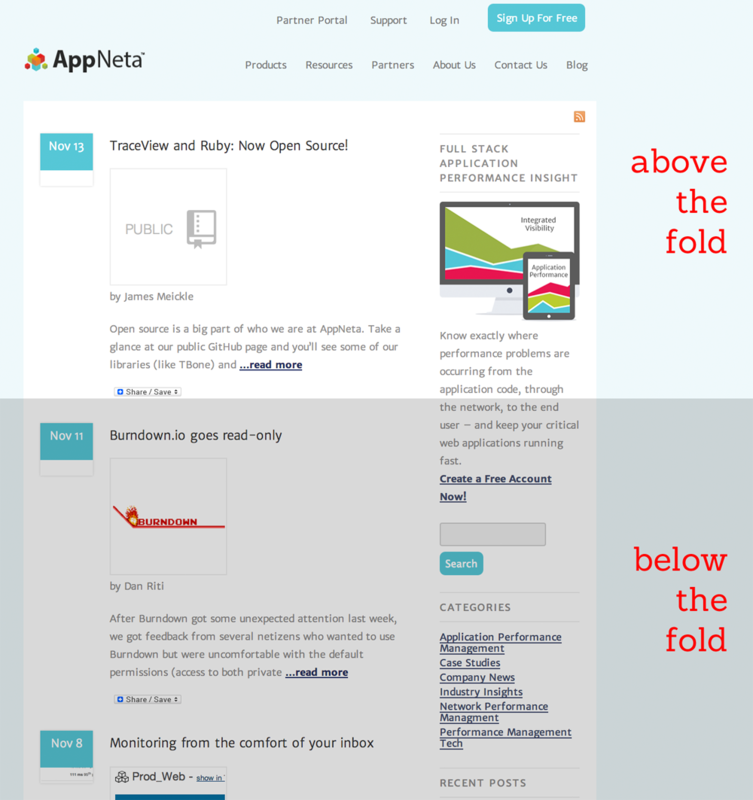 Prioritize the delivery of any content that is “above the fold”. This ensures the minimal amount of time for content to be rendered in the browser, and ultimately should make users happy. Defer everything else, especially anything that will block rendering for “below the fold” content. Not only did our scores jump considerably, but our time to first render (DOMContentLoaded) has improved significantly! However, it looks like defer loading has some side effects, so let’s dig deeper. You should also read this article by Steve Souders. Only a slight score improvement in mobile, but we’re now tied with Google’s PageSpeed score! Unfortunately, none of Google’s suggestions would help us out much here. So now the only thing left is to remove render blocking CSS. To frame the situation, external CSS is network bound and the network is slow. Thus, we want to remove this dependency so we can render our above the fold content as fast as possible. Like before, let’s concatenate all our CSS, minify and see what happens. Did you hear the sonic boom? PageSpeed optimizations directly result in an improved time to first render. This can have a significant impact for a mobile site. Only installing mod_pagespeed is not enough. If anything, it’s only the beginning when it comes to tuning performance for your website. It offers an impressive list of configurable filters that you should read about. Asset concatenation is useful for reducing the number of HTTP requests, DNS lookups, and overall round trip times (RTT). Asset minfication is a must and it’s useful for reducing payload size. 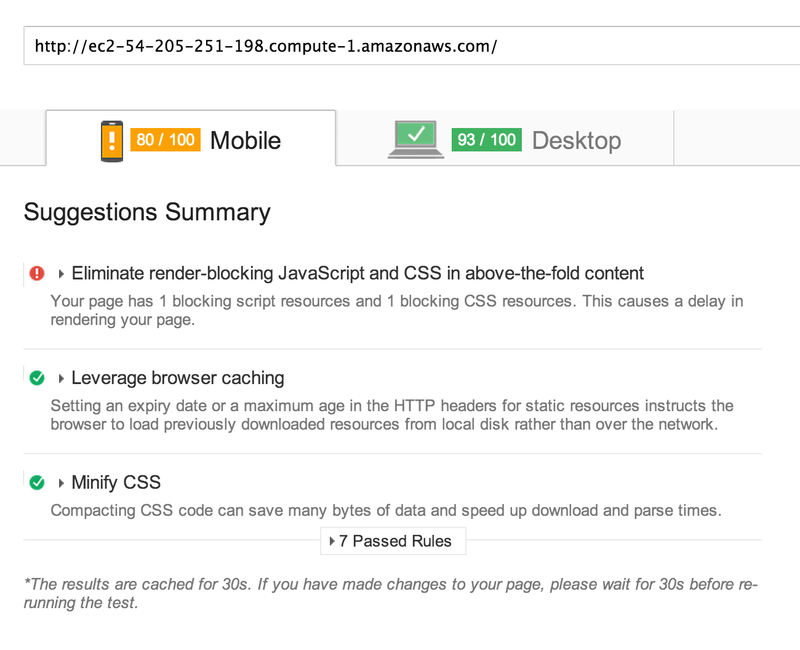 Browser caching is a must. Seriously, do it. The defer loading for CSS is definitely not “production ready” and still needs considerable improvement. Implementing any optimization should always be weighed against the many established web performance best practices. How many of my “solutions” are actually anti-patterns? If so, how can they be improved? Want to read more about what all this actually means to your users? Check out my post on client latency!